Over the last few weeks I've teased you with sneak peeks of the Bridal Hair Accessory that I made for my new daughter in law. You've been asking to see it.... and I've been promising to show it. I love the contemporary cut of the stylised Swarovski crystal leaves and the sparkle they add. It's an elegantly understated piece.... perfectly suited to the bride's simple, modern tastes. A lot of bridal jewellery seems to be composed of just clear crystals but with the Bride choosing not to wear a veil, it was a great opportunity to include some colour in the way of sapphire crystals to tie in with the bridesmaids' beautiful royal blue gowns. 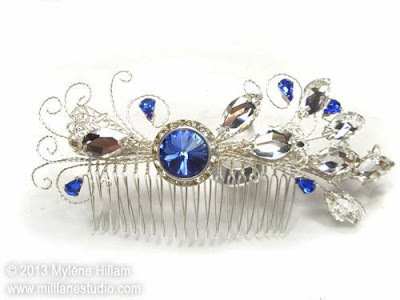 They too wore some of the wire swirls and crystals in their hair. And the asymmetrical design was created with the Bride's hair style in mind - long, and swept off to one side. I'm happy to say, the Bride was delighted with her peacock-inspired hair accessory.